Once again, thanks for all your kind words re: my cat. I just love this little blogging community, seriously, means more than you can possibly know! I decided to feature the first of my fun new things from my cousin's Bag O' Fun! It's a fun and funky shirt from Christopher and Banks actually. I haven't been in there in a very long time, it's always been kind of hit or miss. It used to be one of my mom's favorite stores, but even she hasn't had as much luck there as of late. 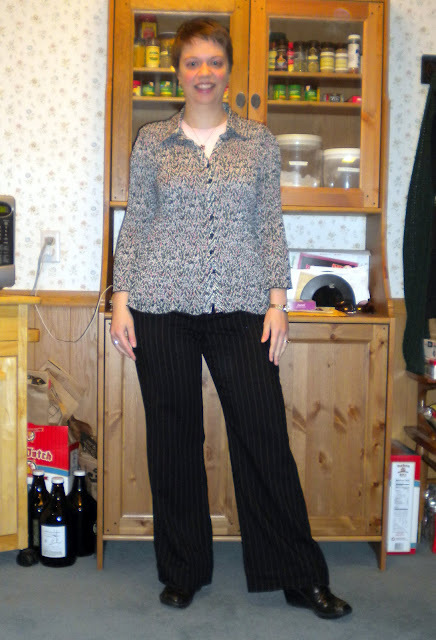 At any rate, this shirt is fun and is a great material, it'll go a long way into the spring and maybe even the summer. I promise this isn't another new handbag. I told you I have a million purses. There are still some that haven't been on the blog yet. I have a problem. And the first step is admitting I have a problem, right? 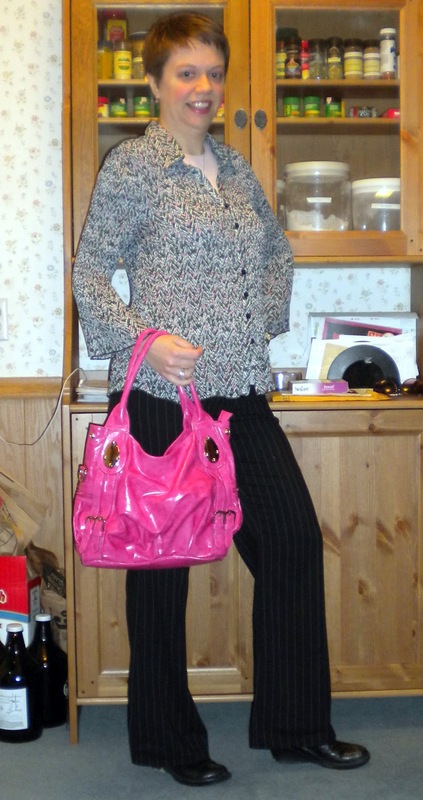 Anyway, this fun pink bag just spoke to me because of the bright pink flecks in the shirt. And I usually pull this bag out in the spring, so it seemed like a good time to do it. And the pictures just don't do justice again to this outfit, because the pants have a pink stripe in them, but that isn't showing up real nicely in the photos I took. Oh well. You believe me because I said that is what they look like, don't you? Short day for me, get to leave early for my one year follow up to Lasik appointment. Granted, last month was the actual one year "anniversary", they couldn't get me in until today. It is still the best thing I have ever done in my life. I highly recommend it! Edited to add - linking up to Tammy from Silverstyle's Trending through the Decades for "Brights" - I think this handbag definitely qualifies!! i am way too scared to get lasik, but i know i would probably love it if i did it! That hot pink bag is killer! 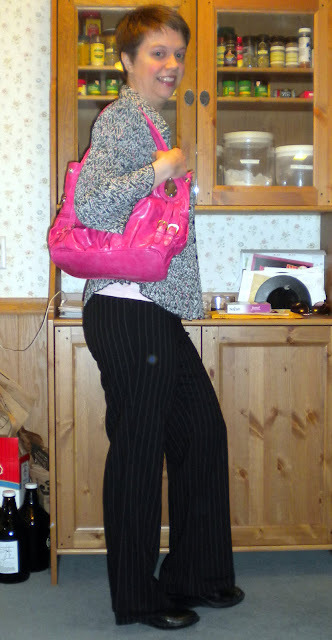 I like the subtle pattern mixing with that hot pink bag. Tis a very nice shirt, yay for cousins!!! What is Lasik?? Awesome bag! I think you have the best bag collection. I'd give my left hand for lasik (wait, maybe not).. but I don't qualify, not that I could a. get through it without freaking out and b. afford it. Ah well, Congrats! I hope it helped. I was lucky in that I had some Health Savings account money from work that I was able to use on the procedure, otherwise I wouldn't have afforded it either! And it isn't so bad as far as not freaking out. As you get older your eyes may stop changing as much and then you may actually qualify more. Lub the bright pink bag. I also have too many bags. I've had my blog for almost 2 years now and I still have not debuted all my bags on it. If that's not bad, I don't know what is. Glad to hear your lasik went well back in the day! It makes me nervous so I think I'll just struggle with contacts the rest of my days. I was nervous too, but the clinic I go to is one of the best in MN and actually the country believe it or not, and the entire thing was so fast. I'd do it again in a heartbeat! Glad to know I'm not alone in the bag collection!! I'm sorry about your cat! I'm so sorry about your kitty cat. I lost a dog last year and I'm still not over it. Hang in there! Thanks - it is hard, though each day is better and better. Cute outfit once again and I LOVE that bag! The bright pink is awesome and a perfect accent to the outfit! Inspiration Monday - Let it rain?